As an investment advisor, you have been subscribed to the MLP Newsletter so that you and your clients can stay abreast of this powerful income-generating sector. Published quarterly, the MLP Newsletter includes valuable information and expert opinion about MLPs that you cannot get anywhere else. The Master Limited Partnership Association (MLPA) is a trade association representing the publicly traded limited partnerships (PTPs) that are commonly known as master limited partnerships (MLPs), and those who work with them. In Like a Lion, Out Like a … Bull? At the start of the millennium, master limited partnerships (MLPs) were hardly part of the investor lexicon. These once obscure investments, which form the backbone of US energy infrastructure (such as pipelines and storage tanks), were little known outside the pocket of yield-hungry retail investors and equity research analysts that covered the sector. That changed quickly after the financial crisis of 2007–2008, as a wider range of investors were drawn to what represented a unique value proposition—a single asset class that offered the benefits of three: equity-like returns, bond-like income, and real asset-like diversification. Many early adopters of MLPs experienced significant return benefits. 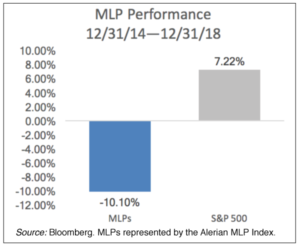 The following charts show the total return, income, and diversification characteristics of MLPs from the inception date of the Alerian MLP Index (June 1, 2006) through the end of 2014, prior to the drop in energy prices. For nearly a decade, many MLP investors enjoyed attractive total returns, high levels of income, and modest correlations to other asset classes. Unfortunately, just as investors were being drawn to the asset class, the story started to unravel. Lack of capital discipline, exposure to commodity prices in the worst oil downcycle bust in a generation, and complex corporate governance led to a series of missteps in the sector. As a result, performance suffered and investor interest started to wane. 2018 represented the lowest fund flows in the space in a decade. Over the last four years, MLPs have dramatically underperformed the market and investors have been running for the exits. However, despite the fact that investors have left the space in droves, and in part because of it, MLPs may represent a particularly compelling case today. First of all, fundamentals are improving. The pullback in MLP prices has forced management teams to clean up their balance sheets, simplify their corporate structures, and focus on long-term sustainability of cash flow. More than 80% of the companies in the Alerian MLP Infrastructure Index (AMZI) have eliminated incentive distribution rights (IDRs)—a complicated incentive system that encouraged accelerated distribution growth but also increased the equity cost of capital and created a potential conflict between MLP management teams and their limited partner investors. Many MLPs have also expressed the desire to self-fund a larger portion of their growth capital expenditures, making them less reliant on equity capital markets. These structural changes have improved balance sheets, lowered the cost of capital, and helped position MLPs for a more sustainable future. In addition to improving company-specific fundamentals, MLPs also stand to benefit from an increasingly supportive macroeconomic environment. Record US production for both oil and natural gas continues to drive demand for pipeline capacity. The United States is expected to account for 70% of worldwide oil production growth in the next five years, and in 2020, for the first time in nearly 70 years, the country is expected to become a net energy exporter.1 Much of this growth in oil and gas production, whether for our own consumption or for export purposes, will need to travel through MLP-owned and operated pipelines. As shown in the charts below, US onshore crude production has increased dramatically over the past decade and is expected to continue for the foreseeable future. Another reason for optimism in the sector is the increased focus on sustainable distribution growth stability over growth at any cost. In the past, investors rewarded MLPs for growing their distributions at a rapid pace but subsequently punished them for needing to cut when market conditions changed. Coverage ratios—essentially the cash-flow cushion MLPs have relative to their distribution payouts—have increased from 1.2 to 1.4 over the past two years, representing a 50% increase in the distribution safety net and a significant shift by management teams toward more sustainable distributions. For the most recent quarter, twelve MLPs in the AMZI Index grew their distributions sequentially, eleven maintained the same distribution, and most importantly, not a single name cut its distribution. Higher distribution coverage ratios may lead to slower distribution growth in the future but should also help MLPs better weather a variety of different economic conditions. The changes taking place in the MLP sector should help attract a wider range of new investors, particularly institutions, which are more concerned with capital discipline, corporate governance, and transparency than with distribution growth. Ironically, as institutions are starting to show more interest, MLPs’ traditional investor base has backed away. In fact, 2018 represented the lowest fund flows into the MLP sector since 2008. Lack of retail investor interest has created a unique situation in which fundamentals have improved but valuations remain compelling, particularly with respect to other risk asset classes. Although MLPs have recovered handsomely in 2019—as of March 21, MLPs are up 18.77% year-to-date and 24.62% from their Dec. 24, 2018, lows, valuations still remain well below their historical averages. Compared to other asset classes, such as stocks and REITs, MLPs are trading far below their all-time high prices. As of the end of February, MLPs are trading at a 27% and 15% discount to their three-year average price-to-cash-flow and enterprise value/EBIDTA (earnings before interest, depreciation, taxes, and amortization), respectively. The recovery is perhaps more compelling because the traditional MLP investor has not participated. To the extent that retail investors are drawn back to the sector, MLPs could experience a further catalyst for price improvement. In Like a Lion and . . .
1 US Energy Information Administration as of 12/3/18. 2 A bull market is defined as an increase in prices of 20%. 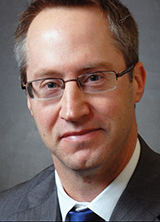 Jeremy Held is director of research at ALPS Advisors. He is responsible for research and product development for the ALPS Asset Management business. Held’s research focuses on both traditional and alternative asset classes; primarily on commodities, master limited partnerships, private equity and U.S. equity sectors. Advisor-Access LLC was designed to bring compelling investment ideas to investors in the form of in-depth interviews with company management and the latest fact sheets and corporate presentations, in a concise format: the critical pieces of information an investor needs to make an informed investment decision.